You should also consider an airbag, cell phone, first aid kit, headlamp, helmet, shelter, etc. You should make a plan with your backcountry partners by contacting your local avalanche forecast center, agreeing on the current avalanche problems, and agreeing on how you will mitigate the risks. For example, you might agree that you will "avoid northeast facing terrain that is above 9,000 feet" or "only ski on terrain that is less than 30 degrees in steepness." Avoidance is always a better than a rescue. Equally important to planning, you should consider your selection of backcountry partners. Do they have a similar acceptance of risk, are they proficient rescuers, will they speak up about their concerns and listen to yours? And finally, you should let someone know where you are going, when you will return, and what they should do if you haven't returned by the planned time. You should wear your avalanche transceiver under your outerwear (preferably on top of your base layer). That will reduce the likelihood that it will be damaged if you slam into trees or rocks, and more importantly, it will ensure that you don't need to take off your transceiver when you change layers while in the backcountry (just as you don't want to take off your seatbelt while driving). A good rule of thumb is to "turn it on when you put it on and turn it off when you take it off." Making sure you never wear your transceiver when it isn't turned on will ensure you that you never enter the backcountry with it turned off. A slightly less stringent rule of thumb is "on in the car and off in the bar." Avalanche transceiver batteries typically last 200 to 300 hours—don't be a cheapskate by trying to conserve your batteries. When you put your transceiver into its harness, face the device's screen toward your body to minimize the chance of it being damaged by obstacles. You should also position the transceiver in its harness so the little blinking light that indicates that it is transmitting is visible (almost all transceivers have a light that serves this purpose). You can keep your transceiver in a well-attached pants pocket in lieu of the transceiver's harness, although it might be more susceptible to impact damage. If you do choose to use a pants pocket, make sure it is the only thing in the pocket. Even foil food wrappers, like energy gels, can interfere with the transceiver's signal. The transceiver should be attached to its harness or your clothing with a leash. The leash might keep the transceiver near you in the extremely unlikely chance that a second avalanche occurs when you are searching, but more importantly, it will keep your transceiver from sliding down the mountain if you drop it. It is preferable to turn off your other electronic gear to avoid interference with your transceiver. If you do keep other electronics turned on, they should be at least 8 inches (20 cm) from your transceiver when you are transmitting and at least 20 inches (50 cm) when searching. You should always perform a "transceiver function test" before heading into avalanche terrain. This test ensures that your, and your partners', avalanche transceiver can transmit and receive. Everyone should turn on their transceivers and state their battery levels. This is a good time to confirm that, in the event of a multiple burial, everyone knows how to turn off their partners' transceivers. The people who are searching should tip their transceivers down slightly so they, and the person who is transmitting, can see their transceiver's screen. After confirming that all the transceivers are receiving the signal, the people who are searching should switch to transmit (aka send) and properly stow their transceivers. The one person who was transmitting should now switch to search mode and, one at a time, move her transceiver near each of the transmitting beacons to confirm that everyone is transmitting and that the distance displayed on her transceiver decreases as it nears each of the transmitting beacons. The person who is searching should then switch her transceiver to transmit and stow it. It is critical that this person does not mistakenly turn off her transceiver, because it won't get checked again. The above process, although it looks complicated when each step is spelled out, is an efficient way to check that each avalanche transceiver can transmit and receive. Starting with one person transmitting, and ending with all but one transceiver transmitting and stowed, is a sound approach. At least annually, you should do a more thorough test of your (and your partner's) transceiver. The above function test, albeit efficient and appropriate, does not test other important features, such as the distance at which your transceiver can receive a signal. Make sure your probe and shovel can be accessed quickly—they should be stored in a dedicated compartment inside your backpack. If they're on the outside of your pack, make sure they can't separate from your pack regardless of how hard you are tumbled. And keep you backpack's waist belt and chest strap fastened so your rescue gear remains with you. If you wear an airbag, be sure to secure the crotch strap. The airbag won't function correctly without it! When in avalanche terrain, keep your hands out of your ski pole straps. In the event of an avalanche, the straps will hinder your ability to self arrest and may prevent you from reaching your airbag's trigger. Although helmets have limited effect on rapid deceleration injuries, they undeniably reduce traumatic brain injuries. If you wear a helmet, make sure it is sized correctly, the chin strap is secure, and consider wearing it on the up-track, too. You should leave your earbuds at home. You might like to groove to music in the backcountry, but doing so may prevent you from hearing "Avalanche!" and they'll undeniably discourage ongoing safety discussions with your partners. It is also likely that your player with interfere with your searching transceiver. 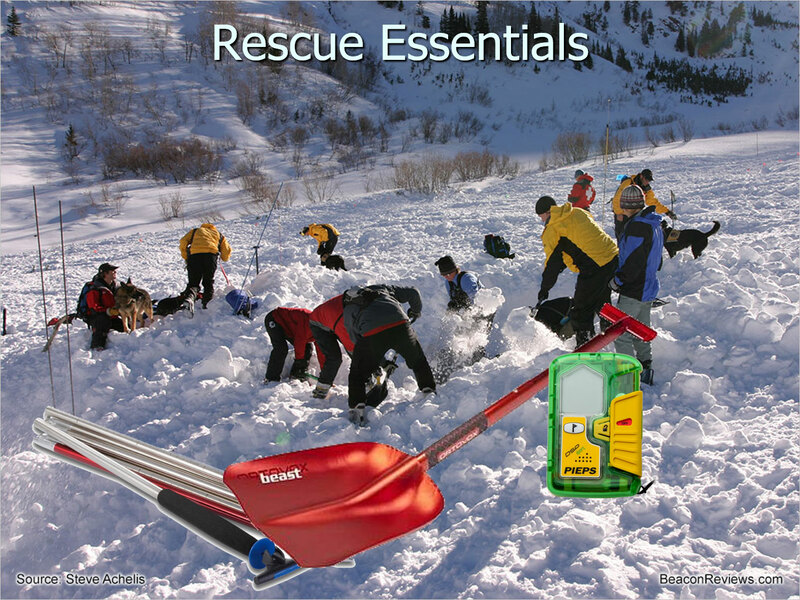 Obviously, the best avalanche rescue is the rescue you never need to perform. Stay safe in avalanche terrain by using safe travel techniques such as using good route selection, only exposing one person at a time, paying attention to clues of snow instability, and communicating frequently and openly with your partners.